Tvheadend is a popular open source TV streaming PVR backend (TV tuner and DVR recording server) software application for Linux supporting DVB-S(2), DVB-C(2), DVB-T(2), ATSC, IPTV (UDP/HTTP), and Analog video (V4L) as input sources. Tvheadend it can be used as a PVR backend of Kodi. Version 3.4 and later of Tvheadend include support for timeshifting (pausing of Live TV). Tvheadend, formerly named "HTS Tvheadend", was previously part of the HTS (Home Theater System) software suite before it spun of into its own project for it as a dedicated PVR backend software product. By levering existing third-party PVR backend applications such as Tvheadend that specialize in receiving television signals and support a client–server model which Kodi can access via a PVR client addon, these PVR features allows you to watch Live TV, listen to radio, view a EPG TV-Guide, schedule recordings and enables many other TV related features, all using Kodi as your primary interface once the initial pairing connection to Tvheadend have been done and and configuration of the PVR client addon for it is complete. The following Kodi/OS distributions come with Tvheadend already installed, or easily installed as an option. These are great one-stop solutions that can greatly simplify the installation of the backend, as well as various other benefits unique to those distros. LibreELEC - LibreELEC is a JeOS implementations for Kodi that comes packaged with the Tvheadend backend software and a Tvheadend Kodi PVR add-on. Most Debian and Ubuntu installations can take advantage of the standard APT installation methods for getting Tvheadend installed, either using a GUI package manager, or from the command line using "apt-get install tvheadend". 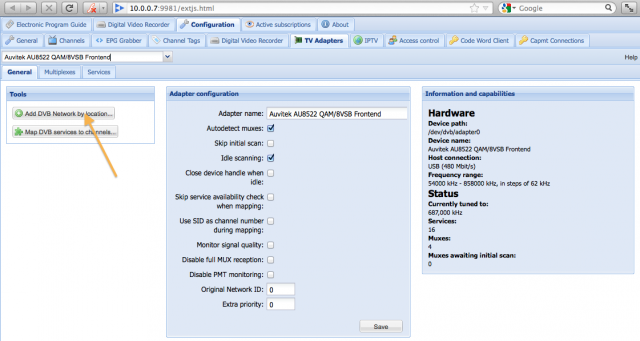 The install procedure normally creates a user named "hts", which is the user Tvheadend will run as. You should check that the "hts" user has sufficient permissions to your tuner (usually /dev/dvb/adapter0/frontend0). Running the command "sudo adduser hts video" should be sufficient. The easiest way to get Tvheadend on the Raspberry Pi series is to use LibreELEC, or a other JeOS implementations for Kodi. You can also use the Arch Linux ARM instructions below if you are using Arch Linux ARM on a Raspberry Pi. This section is probably outdated. Please use an alternative guide such as this for now. Note: This is just the most basic steps needed to get a signal from your PVR backend to Kodi. This guide probably doesn't include everything you will want to do, like name channels, get the electronic programming guide (EPG/TV guide) set up, remove channels, etc. For help with those features see #Additional guides and links. You will see a window like this. 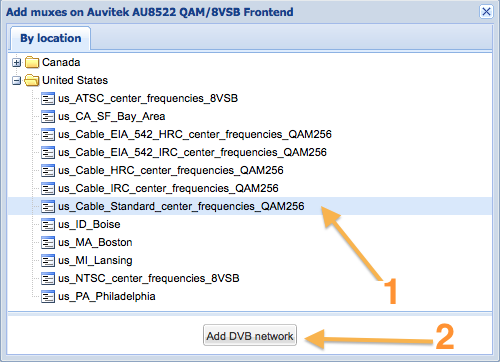 Now you will want to click on "Add DVB Network by location". From the menus select your location and the type of signal you are trying to receive. In this example we're using a generic list for QAM, a US signal for cable TV. 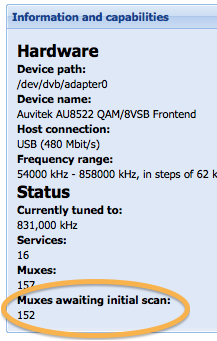 Then click "Add DVB Network" at the bottom. Wait for the number under "Muxes awaiting initial scan" to reach zero. If the number under "Services" is also zero, then that means Tvheadend has not picked up any channels. You may need to check your hardware or if you've selected the right signal type (step 5), or even your tuner driver (see http://linuxtv.org for driver support). [ 4791.147048] xc5000: firmware read 16497 bytes. 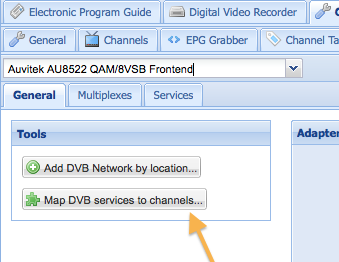 Click on "Map DVB services to channels". You should now be able to pick up TV channels in Kodi once you configure the Tvheadend add-on configuration in the next section, "#Connecting Kodi to Tvheadend". Note: Most versions of Kodi have the PVR add-ons included by default. Your first step in setting up a given PVR add-on is to enable it by going to Settings -> Add-ons -> Disabled add-ons -> PVR and selecting your add-on and then pressing "enable". 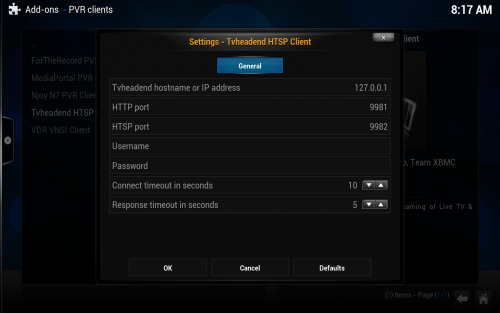 By default, you should only need to fill in Tvheadend hostname or IP address. The hostname or IP address of the server where Tvheadend is installed. If on the same machine then 'localhost' can be used. The default for Tvheadend is 9981 but this will need updating if you have changed it in the Tvheadend settings. The default for Tvheadend is 9982 but this will need updating if you have changed it in the Tvheadend settings. If you have configured Tvheadend to require a username then enter it here. This can be blank. If you have configured Tvheadend to require a password then enter it here. This can be blank. The default is 10 seconds however this can be lowered if you want Kodi to timeout connections to the Tvheadend backend quicker. The default is 5 seconds however this can be lowered if you want Kodi to timeout requests to the Tvheadend backend quicker. This page was last edited on 10 July 2018, at 03:40.